257 new foes to challenge the heroes of the 13th Age! "You could probably reach the goblet if you climbed on top of that stone lion." 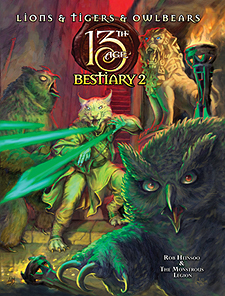 Lions & Tigers & Owlbears: 13th Age Bestiary 2 is full of all-new creatures to complicate heroes' lives, and occasionally rip off their arms. These monsters feature fun and flexible mechanics, story hooks, icon relationships, and loads of customisable elements for your campaign. There's also an appendix by Rob Heinsoo on using some of these menaces in Moon Design's 13th Age in Glorantha. The Gold King, Great Ghoul, and Forest that Walks, fallen icons who must be defeated by a blend of swords, spells, and campaign victories. Unleash the monsters of the 13th Age Bestiary 2 for battles you will never forget.